This post is dedicated to our mostly absent landlord. For the last 2.5 years it’s been a blessing, cause he leaves us alone. But when I cracked a can of Absent Landlord Country Kölsch by Cowbell Brewing, I was pissed off that our toilet was leaking, again. I was not happy to have spent a good chunk of my Monday evening cleaning up sewage after a long work day. Ok let’s get images of grumpy me and overflowing toilets out of your head, and get on with the tale. 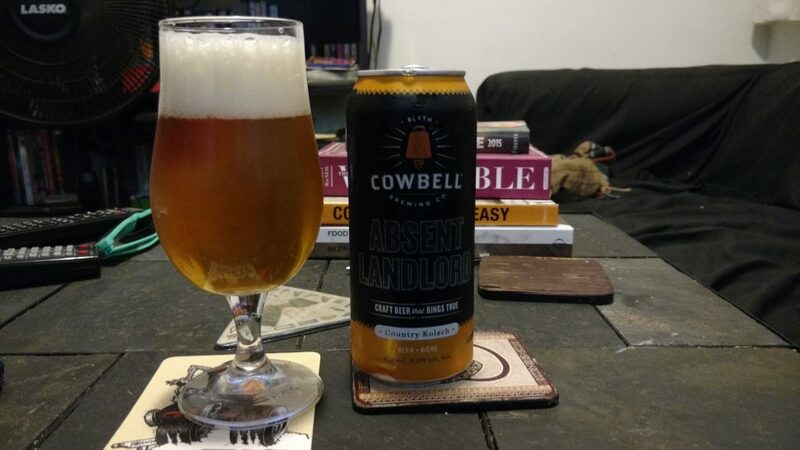 Absent Landlord is the first release of Cowbell Brewing. They are currently a contract brewer, brewing out of Hamilton, while their brewery is under construction – slated to open in the spring of 2017. The brick and mortar brewery is opening in Blythe, ON – a tiny town with a population of 1005, located near Lake Huron. I was lured in by the brewery name (gotta have more cowbell…) and frustration towards my landlord, so I bought this beer. This Kölsch clocks in at 5.3% ABV and a nice light 18 IBU for a very affordable $2.90 tall can from the LCBO. I’m always a little surprised to find Ontario beers labelled as a Kölsch, as this is actually a protected geographical indication term under the EU, and a Kölsch must be brewed within 50 km of Cologne, Germany. A Kölsch is really a lagered ale (think Beau’s Lug Tread) – first it is warm fermented, then it is conditioned at a colder temperature (the lagering process). Alright, that’s enough nerding out on geographical locations of beer for today. Appearance: Dark golden colour, orange reflections. Last white to off-white head. Aroma: Lemon peel and lemon grass. It was soft but pleasant. Faint aroma of Bartlett pears. Taste: White floral notes on the palate with a biscuity finish. Aftertaste: More lemon rind. Smooth and creamy finish. Overall: A good first effort from a brewery, I found this beer quite true to style. It was exactly what I needed after a hot summer day. I’m looking forward to seeing what else they release. Suggested pairing: The brewery suggests soft cheeses, grilled meats, and pastries. I think it would work well with paté or something with a bit more fat in it to offset the beer.